What Makes World's Finest Chocolate the Best Value in Fundraising Programs? World's Finest® Chocolate would love to be your fundraising partner, and we're thrilled to tell you why WFC is considered to be The Best Value in Fundraising! We design fundraising programs that allow you to earn the most profit for the least amount of effort. With up to a 50% profit, World’s Finest® Chocolate brings unparalleled fundraising results. What’s more, you can also earn a bonus when you sell your entire order of chocolate! This shouldn’t be too difficult to accomplish because we offer a variety of low price points that everyone can afford to buy. In addition, and unlike many fundraising companies, WFC also offers you support and service with your fundraiser. We have local sales representatives all over the country that can meet with you personally to develop a fundraising campaign tailored to meet your group’s needs. Your sales representative can set you up with incentives to help increase your group’s participation and suggest the best products and timing to help you reach your goal. 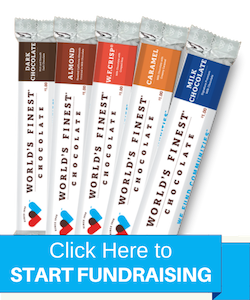 World’s Finest® Chocolate is proud to provide the easiest fundraising program in the shortest amount of time. Our chocolate bars practically sell themselves because supporters know they can’t resist the rich, sweet taste of World’s Finest® Chocolate. The simple, in-hand delivery method makes our chocolate products that much more irresistible, while also saving you time and energy. We believe that the selling process should remain basic, easy, and stress-free. With our program, it is not necessary to recruit a lot of volunteers or manage a long sale time period. This makes our fundraising program the perfect opportunity for you to teach the children of your organization fundamental financial and sales skills, while also instilling a sense of pride for your organization. There is so much more than chocolate wrapped in a World’s Finest® Chocolate Bar. Aside from delicious, premium-quality products, fundraising supporters love to know that they are helping a local cause. Reading your personalized label on the box (and even the bar) fills them with nostalgia, reminding them of times when they also fundraised for something they believed in. Supporters are getting the most for their money when they purchase our products. The back of each chocolate bar contains an activation code for a free membership to Three Winners, a coupon site with access to over 50,000 printable coupons nationwide. When you purchase World’s Finest® Chocolate, you are also supporting fellow working Americans, as all of our chocolate is made in the USA. Still Skeptical We're the BEST Fundraising Company for You? Give Us the Chance to Make You a Believer!